Imagine yourself in the hands of a terrorist who is ready to kill you! Imagine that no one can rescue you and you are your only hope to survive! Nowadays unfortunately such situation can happen to anyone. Don't you want to have some knowledge about what to do is such situation? KMG Japan gives you the opportunity to discover or review some of the technics that can help you deal with Hostage Situation? Krav Maga as a system has been used by military, law enforcement and special units since the birth of Krav Maga in the 1940's and after the State of Israel was formed in 1948, Krav Maga has been the preferred combat system of the Israeli Defense Forces (IDF). KRAV MAGA GLOBAL is the world's leading provider of Krav Maga training for government sectors (military, law enforcement and security). 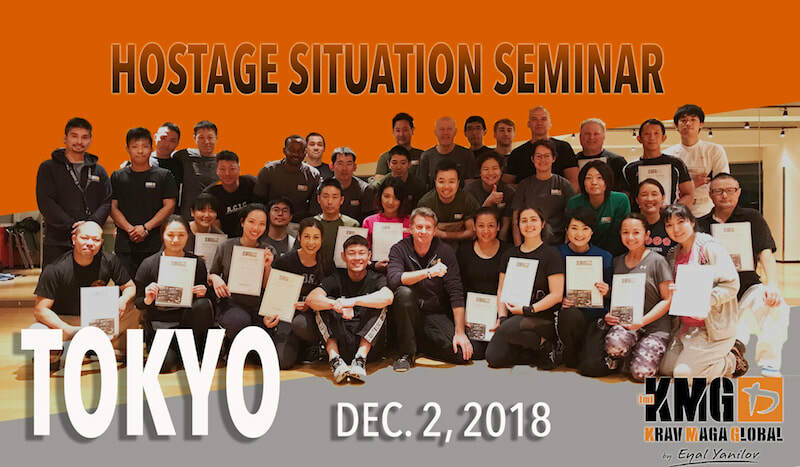 Technics and tactics developed for the security and military sectors can be applied for the protection of civilian and this is what KMG Japan proposes to share with you on December 2nd in Tokyo. Discover how to deal with Hostage Situation for protecting yourself or protecting others. ​Edwin is a Krav Maga expert specialized in Military Krav Maga and he used to be an operator in VIP protection. He started his Krav Maga journey in 2005 while he was in the Commandos of the Singapore Army Forces and later on he became head instructor for Krav Maga training in his unit. Edwin is currently the Director and Head Instructor of KMG Singapore, he is also a member of KMG Global International Team (teaching Krav Maga around the world). Besides he is still teaching Krav Maga to military and law enforcement units in his country. THANK YOU TO ALL THE PARTICIPANTS! Noa Studio Gakugei Daigaku, Himonya 5-25-10, Meguro-ku, Tokyo.